January 17, 2015, Victoria, BC (ISN) – If the Vancouver Island Junior Hockey League (VIJHL) playoffs that start in late February evolve anything like the VIJHL All-Star game that was played Sunday evening, then the North Division teams will have their work cut out for themselves, as the South Division All-Stars put on an offensive clinic, thumping the North 14-4 in front of approximately 500 people at The Q Centre in Colwwod. 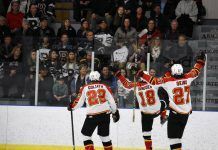 Loaded with six players from the league-leading Victoria Cougars, the South were perhaps surprisingly led Sunday in the offensive onslaught by a pair of Peninsula Panthers, including Cameron Thompson, who had three goals and three assists and last minute addition Grayden Hohl, who chipped in four assists. Kerry Park’s Zack Smith also was a leader on the scoresheet with a goal and three assists. The high-flying Cougars, as one would expect, did contribute on the day, with four of their five players getting in the scoring column including Nathan Looysen with two goals and an assist, Dom Kolbeins and Cody Hodges, both with a goal and an assist each and Austin Wilk with an assist. Players from the host Westshore Wolves also made an impact on their home ice, with Tanner Sidaway notching a pair, Brandon Tangey adding a solo marker and Chase O’Keefe adding an assist. Other South scoring included a goal and an assist from the Saanich Braves Taylor Leger, goals from Saanich’s Nick Kean and Kerry Park’s Ryan Paisley, a pair of assists from Peninsula defenceman Spencer Loverock and an assist from the Braves’ Connor Birmingham. For the North, four different players had goals including Oceanside’s Quinlan Moore and Mathiau Jaubert, Nanaimo’s Will Koop and Campbell River’s Alex Brewer. Nanaimo’s Billy Walters added three assists, while Jaubert, Oceanside’s Cameron Nickerson and Nanaimo’s Trent Bell were all credited with solo assists. While the game began relatively evenly with the South holding a 2-1 lead after one period, a five-goal second period and seven-goal third period put things well out of reach for the visiting North side. Final shots were also heavily weighted to the South 55-25. With his three goals and three assists, Peninsula’s Thompson earned first star honours, while Victoria’s Looysen was the second star. Nanaimo’s Walters, with his three assists, was the games third star. The VIJHL will continue their home stretch on Wednesday, when the Cougars travel to Westshore to take on the Wolves. Those same Cougars then host the Saanich Braves Thursday, while the North resumes action as well, when Comox visits Nanaimo. 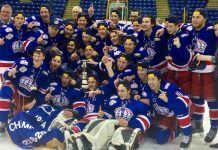 In the standings, Victoria in the South and Campbell River in the North, are well-locked into their first place positions, but the races for the remaining playoff spots in each divison are very tight. In the North, Nanaimo (39 points) and Comox (32) points look like they will duke it out for second, while Oceanside (24 points) seems destined for fourth. In the South, Kerry Park and Peninsula are presently tied for second with 41 points each, with the Wolves nipping at their heels with 39 points. Like Oceanside in the North, the Saanich Braves sit last in the South, with an outside chance of catching the fourth place Wolves.